The Greater Plains Collaborative (GPC), a new network of 10 leading medical centers in seven Midwestern states, is a component of PCORnet, our national patient-centered clinical research network initiative. The collaborative is committed to improving health care by embedding research in routine patient care, encouraging adoption of evidence-based practices, and disseminating research findings. As the PCORI Engagement Officer for PCORnet, I work closely with our science staff and the individual networks to support meaningful stakeholder engagement. So I was thrilled to attend GPC’s gathering of a diverse group of patients, patient advocates, researchers, clinicians, and research administrators from all of its sites for its Learning Engagement Kickoff, to initiate the project’s patient-engagement activities. PCORI Executive Director Joe Selby, MD, MPH, and Program Officer Maryan Zirkle, MD, MS, MA, also attended. At the conference, held at the Kansas University Medical Center in Kansas City, participants discussed opportunities for patients to take part in the GPC’s development. They also reviewed the health issues—breast cancer, obesity, and amyotrophic lateral sclerosis (ALS)—on which the collaborative plans to focus and potential data-sharing strategies and concerns. Sometimes, the best way to tell a story is to draw a picture. Graphic facilitator Jeannel King did that at the GPC meeting with illustrations that helped promote a common understanding of the group’s priorities, ideas, and themes. PCORnet is made up of 11 clinical data research networks, including GPC, and 18 patient-powered research networks, which are operated by patients and focus on a particular condition. PCORnet’s overall goal is to create a large, highly representative electronic data infrastructure to support more efficient and cost-effective comparative clinical effectiveness research and other types of studies that will help patients and those who care for them make better-informed health decisions. True to the PCORI approach to research generally, PCORnet is being built in partnership with patients, caregivers, clinicians, and other healthcare stakeholders. These stakeholders participate in the governance and activities of PCORnet. There are stakeholders on the PCORnet Executive Committee, Steering Committee, and Task Forces, and there is also a PCORnet Patient Council to ensure the highest standards of patient-centeredness in the network’s policies. At the conference, attendees broke into small discussion groups. Some patients shared their preferences for learning about research opportunities and results. Patient representatives from Hispanic/Latino and African-American communities emphasized the role of families in making decisions about research participation. There was consensus on the importance of following up with patient partners and research participants once a study is complete. The patients explained that trust is built and sustained when a research team expresses appreciation for their participation and disseminates findings in a way that is understandable and relevant to the communities involved. The patients also expressed enthusiasm for multiple approaches to sharing their experiences while in a trial. For example, for meaningful consent, patients talked about the importance of providing an opportunity for patients and family to have a relationship with the person who is facilitating enrollment and to ask questions about participating in the project. During a discussion on preferred methods for collecting patient-reported outcomes, patients pointed out the need for multiple approaches to collecting data and for considering health literacy issues in adopting mobile technology. Groups that focused on obesity, breast cancer, and ALS discussed cohort characterization, the process of describing a condition and defining its features for use in providing a digital description of a group of patients. The breast cancer group suggested categories that might help shed light on potential causes of breast cancer: occupation, air and water quality, diet, childbearing status, and area of residence. The patients attending the obesity discussion considered various factors including cultural norms on what defines a healthy weight, the opportunity to exercise, and use of medications that may affect weight. The ALS group recommended changes to a survey that will be used in clinics. GPC Principal Investigator Lemuel (Russ) Waitman took the participants on a virtual tour of the web portal to the GPC database so they could see how patient data are described there. He discussed how data are collected and stored and how researchers will be able to use the data to answer research questions. Patients said that seeing the database helped them appreciate the value of data collection and sharing. Laurel Hoeth, a patient from the Marshfield (Wisconsin) Clinic, shares her expectations for the kickoff conference. The participants then brought up the importance of a clear, consistent GPC communications plan to facilitate recruitment and retention of patients into the network. As a result, GPC staff have decided to give high priority to communications efforts across all the sites. I look forward to reporting back to you as I continue to learn about promising examples and patterns of successful patient and other stakeholder engagement in PCORnet. 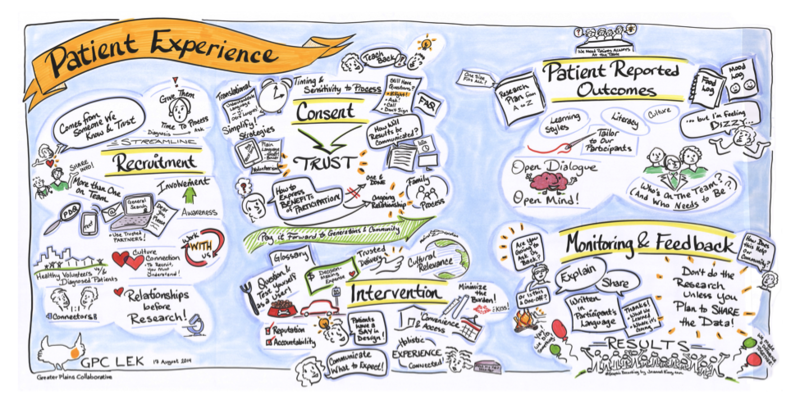 These illustrations will be included in an extensive repository of best practices for meaningful engagement in research projects and networks that PCORI is building to share with researchers, patients, and other stakeholders.